The Christiana condos for sale are different from its neighbors in the Four Season, or Columbine Loop area. 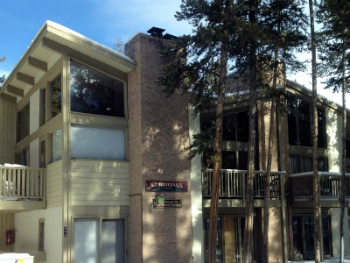 It’s very near the base area of Peak 9 at the Breckenridge Ski Resort, and close to town like all the others, but the homes are townhome style and slightly bigger than the adjacent condos. There are only seven Christiana homes built in one modernesque building with two-story windows. All are two bedrooms, open and sunny, but each town home has a unique floorplan. Most have a loft, and some a walk-out lower level. In the summer the grounds are well landscaped and off both sunny spots and yard that is nestled in the large trees that were preserved in the Columbine neighborhood. Browse the Christiana condominium listings below to find that perfect home, or find out more more about the Breckenridge community. The free town shuttle bus stops outside of Christiana and can take residents anywhere in town, year round. Trails exist through the neighborhood to bike or walk to the south side of town, which is only a block away. And neighborhood ski trails are maintained to allow access from any home for sale in Christiana to the base of Peak 9. Size: 1184 to 1424 sq. ft. Located at 900 Columbine Rd. in Warriors Mark, across the Blue River from the base of Peak 9, on the inner circle of the Columbine Loop, just south of the Columbine neighborhood pool. Drive south on Main Street to last stoplight at Boreas Pass Road, turn right on Broken Lance Drive. At the three-way stop make a left and remain on Broken Lance, soon this intersects with Columbine. The road is a loop and Christiana will be the second on the right, between the Snowdrop and Motherlode condos. Ready to contact Breckenridge Associates? Send us a message or call us at (970) 453-2200 now.